Accounts of the financial crisis leave out the story of the secretive deals between banks that kept the show on the road. How long can the system be propped up for? It is a decade since the first tremors of what would become the Great Financial Crisis began to convulse global markets. Across the world from China and South Korea, to Ukraine, Greece, Brexit Britain and Trump’s America it has shaken our economy, our society and latterly our politics. Indeed, it has thrown into question who “we” are. It has triggered both a remarkable wave of nationalism and a deep questioning of social and economic inequalities. Politicians promise their voters that they will “take back control.” But the basic framework of globalisation remains intact, so far at least. And to keep the show on the road, networks of financial and monetary co-operation have been pulled tighter than ever before. In Britain the beginning of the crisis was straight out of economic history’s cabinet of horrors. 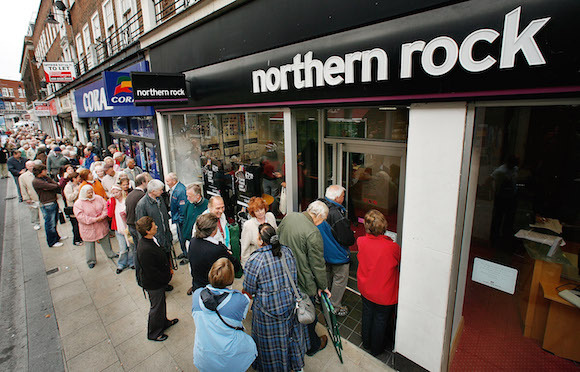 Early in the morning of Monday 14th September 2007, queues of panicked savers gathered outside branches of the mortgage lender Northern Rock on high streets across Britain. It was—or at least so it seemed—a classic bank run. Within the year the crisis had circled the world. Wall Street was shaking, as was the City of London. The banks of South Korea, Russia, Germany, France, Belgium, the Netherlands, Ireland and Iceland were all in trouble. We had seen nothing like it since 1929. Soon enough Ben Bernanke, then chairman of the US Federal Reserve and an expert on the Great Depression, said that this time it was worse. But the fact that the tumult assumed such spectacular, globe-straddling dimensions had initially taken Bernanke by surprise. In May 2007 he reassured the public that he didn’t think American subprime mortgages could bring down the house. Clearly he underestimated the crisis. But was he actually wrong? For it certainly wasn’t subprime that brought down Northern Rock. The British bank didn’t have any exposure in the United States. So what was going on? The familiar associations evoked by the Northern Rock crisis were deceptive. It wasn’t panicking pensioners all scrambling to withdraw their savings at once that killed the bank. It wasn’t even the Rock’s giant portfolio of mortgages. The narrative of Michael Lewis’s The Big Short, of securitisation, pooling and tranching, the lugubrious details of trashy mortgage dealing, the alphabet soup of securitised loans and associated derivatives (MBS, CDO, CDS, CDO-squared) tell only one part of the story. What really did for banks like Northern Rock and for all the others that would follow—Bear Stearns, Merrill Lynch, Lehman, Hypo Real State, Dexia and many more—and what made this downturn different— so sharp, so sudden and so systemic, not just a recession but the Great Recession—was the implosion of a new system not just of bank lending, but of bank funding. It is only when we examine both sides of the balance sheet—the liabilities as well as the assets—that we can appreciate how the crisis was propagated, and then how it was ultimately contained at a global level. It is a story that the crisis-fighters have chosen not to celebrate or publicise. Ten years on, the story is worth revisiting, not only to get the history right, but because the global fix that began to be put in place in the autumn of 2007 is in many ways the most significant legacy of the crisis. It is still with us today and remains largely out of sight. The hidden rewiring of the global monetary system provides reassurance to those in the know, but it has no public or political standing, no resources with which to fight back if attacked. And this matters because it is increasingly out of kilter with the nationalist turn of politics. In the wake of the crash and its austere aftermath, voters in many countries have pointed the finger at globalisation. The monetary authorities, however, have quietly entwined themselves more closely than ever before—and they have done so in order to provide life support to that bank funding model which caused such trouble a decade ago. Ten years on, the question of whether this fix is sustainable, or indeed wise, is a question of more than historical interest. In 2007 economists were expecting a crisis. Not, however, the crisis they got. The standard crisis scenario through to autumn that year involved a sudden loss of confidence in American government debt and the dollar. In the Bush era, the Republicans had cut taxes and spent heavily on the War on Terror, borrowing from China. So what would happen, it was asked anxiously, if the Chinese pulled the plug? The great fear was that the dollar would plunge, interest rates would soar and both the US economy and the Chinese export sector would crash land. It was what Larry Summers termed a balance of financial terror. America’s currency seemed so doomed that in autumn 2007, the US-based supermodel Gisele Bündchen asked to be paid in euros for a Pantene campaign, and Jay-Z dissed the dollar on MTV. But somewhat surprisingly, like the nuclear stand-off in the Cold War, the financial balance of terror has become the basis for a precarious stability. Crucially, both Beijing and Washington understand the risks involved, or at least they seemed to until the advent of President Donald Trump. Certainly during the most worrying moments in 2008 Hank Paulson, Bush’s last Treasury Secretary, made sure that Beijing understood that its interests would be protected. Beijing reciprocated by increasing its commitment to dollar assets. Banks borrow money short-term at low interest and lend long at marginally higher rates. It may sound precarious, but it is how they earn their living. In the conventional model, however, the short-term funding comes from deposits, from ordinary savers. Ordinarily, in a well-run bank, their withdrawals and deposits tend to cancel each other out. Fits of uncertainty and mass withdrawals are always possible, and perhaps even inevitable once in a while. So to prevent them turning into bank runs, governments offer guarantees up to a reasonable amount. Most of the Northern Rock depositors had little to fear. Their deposits were, like all other ordinary savers, guaranteed by then Chancellor Alistair Darling. The investors who weren’t covered by government backing were those who had provided Northern Rock with funding through a new and different channel—the wholesale money market. They had tens of billions at stake, and every reason to panic. It was the sudden withdrawal of this funding that actually killed Northern Rock. As well as taking in money from savers, banks can also borrow from other banks and other institutional investors. The money markets offer funds overnight, or for a matter of weeks or months. It is a fiercely competitive market with financial professionals on both sides of every trade. Margins are slim, but if the volumes are large there are profits to be made. For generations this was the preserve of investment bankers—the ultimate insiders of the financial community. They didn’t bother with savers’ deposits. They borrowed in the money markets. From the 1990s commercial banks and mortgage lenders began to operate on a similar model. It was this new form of “market-based” banking combined with the famous securitisation of mortgages that enabled the huge expansion of European and US banking that began to crash in 2007. By the summer of 2007 only 23 per cent of Northern Rock’s funding came from regular deposits. More than three quarters of its operation was sustained by borrowing in capital and money markets. For these funds there were no guarantees. For a run to develop in the money market, the mortgages did not need to default. All that needed to happen was for the probability of some of them defaulting to increase. That was enough for interbank lending and money market funding to come abruptly to a halt. The European money markets seized up on 9th August. Within a matter of days Northern Rock was in trouble, struggling to repay short-term loans with no new source of funding in prospect. And it was through the same funding channel that the crisis went global. The attraction of money market funding was that it freed you from the cumbersome bricks-and-mortar branch network traditionally used to attract deposits. Using the markets, banks could source funding all over the world. South Korean banks borrowed dollars on the cheap to lend in Won. American banks operating out of London borrowed Yen in depressed Japan, flipped them into dollars and then lent them to booming Brazil. The biggest business of all was the “round tripping” of dollars between America and Europe. Funds were raised in America, which for reasons of history and the nation’s sheer scale, is the richest money market in the world. Those dollars were exported to institutions and banks in Europe, who then reinvested them in the US, very often in American mortgages. The largest inflow of funds to the US came not from the reinvestment of China’s trade surplus, but through this recycling of dollars by way of Europe’s banks. Barclays didn’t need a branch in Kansas any more than Lehman did. Both simply borrowed money in the New York money markets. From the 1990s onwards, Europe’s banks, both great and small, British, Dutch, Belgian, French, Swiss and German, made themselves into a gigantic trans-Atlantic annex of the American banking system. All was well so long as the economy was buoyant, house and other asset prices continued to go up, money markets remained confident and the dollar moved predictably in the direction that everyone expected, that is gently downwards. If you were borrowing dollars to fund a lending business the three things that you did not want to have happen were: for your own loans to go bad; money markets to lose confidence; or for dollars to suddenly become scarce, or, what amounts to the same thing, unexpectedly expensive. While the headlines were about sub-prime, the true catastrophe of the late summer of 2007 was that all three of these assumptions were collapsing, all at once, all around the world. The real estate market turned down. Large losses were in the pipeline, over years to come. But as soon as Bear Stearns and Banque Nationale de Paris (BNP) shut their first real estate funds, the money markets shut down too. Given the global nature of bank funding this produced an acute shortage of dollar funding across the European and Asian banking system. It was the opposite of what the best and brightest in macroeconomics had expected: strong currencies are, after all, meant to be built on thrift and industry, not shopping splurges and speculative debts. But rather than the world being glutted with dollars, quite suddenly banks both in Europe and Asia began to suffer periodic and panic-inducing dollar shortages. The paradigmatic case of this counterintuitive crisis would eventually be South Korea. How could South Korea, a champion exporter with huge exchange reserves be short of dollars? The answer is that in the years of the recovery from the 1997 East Asian crisis, while Korean companies Hyundai and Samsung had conquered the world, Korea’s banks had been borrowing dollars at relatively low interest rates to lend out back home in Won to the booming home economy. Not only was there an attractive interest rate margin, but thanks to South Korea’s bouyant exports, the Won was steadily appreciating. Loans taken out in dollars were easier to repay in Won. As such these loans cushioned the losses suffered by South Korean firms on their dollar export-earnings. By the late summer of 2008 the South Korean banks operating this system owed $130bn in short-term loans. Normally this was no problem, you rolled over the loan, taking out a new short-term dollar credit to pay off the last one. But when the inter-bank market ground to a halt the South Koreans were painfully exposed. Barring emergency help, all they could do was to throw Won at the exchange markets to buy the dollars they needed, which had the effect of spectacularly devaluing their own currency and making their dollar obligations even more unpayable. South Korea, a country with a huge trade surplus and a large official dollar reserve, faced a plunging currency and a collapsing banking system. In Europe the likes of RBS, Barclays, UBS and Deutsche had even larger dollar liabilities than their South Korean counterparts. The BIS, the central bankers’ bank, estimated that Europe’s mega-banks needed to roll over $1-1.2 trillion dollars in short-term funding. The margin that desperate European banks were willing to pay to borrow in sterling and euro and to swap into dollars surged. Huge losses threatened—and both the Bank of England and the European Central Bank (ECB) could not do much to help. Unlike their East Asian counterparts, they had totally inadequate reserves. The one advantage that the Europeans did have over the Koreans, was that the dollars they had borrowed had largely been invested in the US, the so-called “round-tripping” again. The huge portfolios of American assets they had accumulated were of uncertain value, but they amounted to trillions of dollars and somewhere between 20 and 25 per cent of the total volume of asset- and mortgage-backed securities. In extremis the Europeans could have auctioned them off. This would have closed the dollar-funding gap, but in the resulting fire sales the European banks would have been forced to take huge write downs. And most significantly, the efforts by the Fed and the US Treasury to stabilise the American mortgage market would have been fatally undercut. This was the catastrophic causal chain that began to emerge in August 2007. How could the central banks address it? The answer they found was three-pronged. The most public face of crisis-fighting was the effort to boost the faltering value of the mortgage bonds on the banks’ books (typically securitised versions of other banks’ mortgage loans, which were becoming less reliable in the downturn), and to provide the banks with enough capital to absorb those losses that they would inevitably suffer. This was the saga of America’s Troubled Asset Relief Programme, which played out on Capitol Hill. In the case of Northern Rock this prong involved outright nationalisation. Others took government stakes of varying sizes. Warren Buffett made a lucrative investment in Goldman Sachs. Barclays has now been charged by the Serious Fraud Office with fraudulently organising its own bailout, by—allegedly—lending money to Qatar, which that state is then said to have reinvested in Barclays. Without the bailout, you ended up with Lehman: bewildered bankers standing on the pavements of the City and Wall Street carrying boxes of their belongings. The masters of the universe plunged to earth. It half-satisfied the public’s desire for revenge. But it did nothing for business confidence. With enough capital a bank could absorb losses and stay afloat. But to actually operate, to make loans and thus to sustain demand and avert a downward spiral of prices and more bankruptcies, the banks needed liquidity. So, secondly, the central banks stepped in, taking over the function, which the money market had only relatively recently assumed but was now suddenly stepping back from, of being the short-term lenders. The ECB started as early as August 2007. The Bank of England came in late, but on a large scale. The Fed became the greatest liquidity pump, with all of Europe’s banks benefiting from its largesse. The New York branches of Barclays, Deutsche, BNP, UBS and Credit Suisse were all provided with short-term dollar funding on the same basis as Citi, Bank of America, JP Morgan and the rest. But it was not enough. The Europeans needed even more dollars. So the Fed’s third, final and most radical innovation of the crisis was to devise a system to allow a select group of central banks to funnel dollars to their banks. 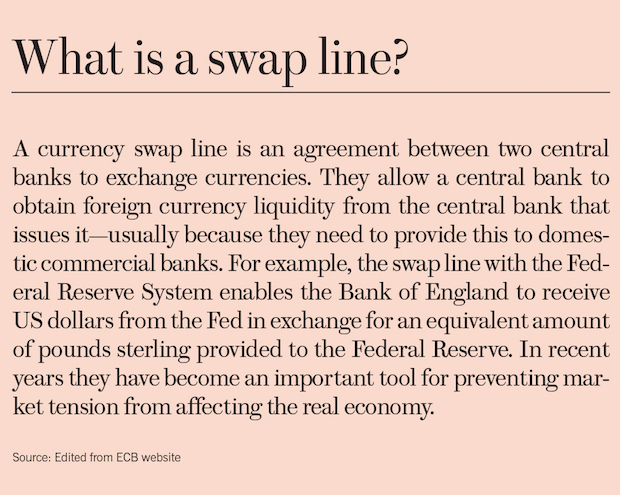 To do so the Fed reanimated an almost-forgotten tool called the “swap lines,” agreements between central banks to trade their currencies in a given quantity for a given period of time. They had been used regularly in the 1960s, but had since gone out of use. Back then, the aim was stabilising exchange rates. This time, the aim was different: to stabilise a swollen banking system that was faltering, and yet abjectly too big to fail. At a moment when dollars were hard to come by, the new swap lines enabled the ECB to deposit euros with the Fed in exchange for the dollars that the eurozone banks were craving. The Bank of England benefited from the same privilege. Not that they were welcome at first. When the Fed first mooted the idea in the autumn of 2007, the ECB resisted. It did not want to be associated with a crisis that was still seen largely as American. If Gisele didn’t want to be paid her modelling fees in US dollars, why on earth should the ECB be interested? But as the European bank balance sheets unravelled, it would soon become obvious that Frankfurt needed all the dollars it could get. Initiated in December 2007, the swap lines would rapidly expand. By September all the major European central banks were included. In October 2008 the network was expanded to include Brazil, Australia, South Korea, Mexico, New Zealand and Singapore. For the inner European core, plus Japan, they were made unrestricted in volume. The sums of liquidity were huge. All told, the Fed would make swap line loans of a total of $10 trillion to the ECB, the Bank of England the National Bank of Switzerland and other major banking centres. The maximum balance outstanding was $583bn in December 2008, when they accounted for one quarter of the Fed’s balance sheet. It was a remarkable moment: the Fed had effectively established itself as a lender of last resort to the entire global financial system. But it had done so in a decentralised fashion, issuing dollars on demand both in New York and by means of a global network of central banks. Not everyone was included. Russia wasn’t, which was hardly surprising given that it had come to blows with the west over Georgia’s Nato membership application only weeks earlier. Nor did the Fed help China or India. And though it helped the ECB, it did not provide support to the “new Europe” in the east. The Fed probably imagined that the ECB itself would wish to help Poland, the Baltics and Hungary. But the ECB’s president Jean-Claude Trichet was not so generous. Instead, eastern Europe ended up having to rely on the International Monetary Fund (IMF). The swap lines were central bank to central bank. But who did they really help? The reality, as all those involved understood, was that the Fed was providing preferential access to liquidity not to the “euro area” or “the Swiss economy” as a whole, but to Deutsche Bank and Credit Suisse. Of course, the justification was “systemic risk.” The mantra in Washington was: you have to help Wall Street to help Main Street. But the immediate beneficiaries were the banks, their staff, especially their highly-remunerated senior staff and their shareholders. Though what the Fed was doing was stabilising the global banking system, it never acknowledged as much in so many words, certainly not on the record, where it said as little as it decently could about the swap line operation. The Fed’s actions have global effects. But it remains an American institution, answerable to Congress. Its mandate is to maintain employment and price stability in the US economy. The justification for the swap lines, therefore, was not global stability, but the need to prevent blowback from Europe’s de facto Americanised banks—to avoid a ruinous, multi-trillion dollar fire sale of American assets. Once the worst of the crisis had passed, Bernanke would assist the European banks in liquidating their American assets by way of the Fed’s three rounds of asset purchases, known as Quantitative Easing (QE). The swaps were meticulously accounted for. Every cent was repaid. No losses were incurred—the Fed even earned a modest profit. They were not exactly covert. But given the extraordinary extension of its global influence that the swaps implied, they were never given publicity, nor even properly discussed. Bernanke’s name will be forever associated with QE, not swap lines. In his lengthy memoirs, The Courage to Act, the swaps merit no more than a few cursory pages, though Bernanke as a scholar of the 1930s knows very well just how crucial these instruments were. Is this an accident? Surely not. In the case of the swap lines, the courage to act was supplemented by an ample measure of discretion. One other reason for the tight lips is that the story of the swap lines is not yet over. The network was rolled out in 2007 and 2008 as an emergency measure, but since then it has become the under-girding of a new system of global financial crisis management. In October 2013, as the Fed prepared finally to begin the process of normalisation by “tapering” its QE bond purchases, it made another decision which made plain that the new normal would not be like the old. It turned the global dollar swap line system into a standing facility: that is to say, it made its emergency treatment for the crisis into a permanent feature of the global monetary system. On demand, any of the core group of central banks can now activate a swap line with any other member of the group. Most recently the swap line system was readied for activation in the summer of 2016 in case of fallout from the Brexit referendum. As the original crisis unfolded in 2008, radical voices like Joseph Stiglitz in the west, and central bankers in the big emerging economies called for a new Bretton Woods Conference—the meeting in 1944, which had decided on the post-war currency system and the creation of the IMF and the World Bank. The Great Financial Crisis had demonstrated that the dollar’s exorbitant privilege was a recipe for macroeconomic imbalances. The centre of gravity in the world economy was inexorably shifting. It was time for a new grand bargain. What these visionary suggestions failed to register was that foundation of the world’s de facto currency system were not public institutions like the IMF, but the private, dollar-based global banking system. The introduction of the swap lines gave that system unprecedented state support. The Fed had ensured that the crisis in global banking did not become a crisis of the dollar. It had signalled that global banks could rely on access to dollar liquidity in virtually unlimited amounts, even in the most extreme circumstances. The central banks had, in other words, staged their Bretton Woods 2.0. But they had omitted to invite the cameras or the public, or indeed to explain what they were doing. The new central bank network created since 2008 is of a piece with the new networks for stress testing and regulating the world’s systemically important banks. The international economy they regulate is not one made up of a jigsaw puzzle of national economies, each with its gross national product and national trade flows. Instead they oversee, regulate and act on the interlocking, transnational matrix of bank balance sheets. This system was put in place without fanfare. It was essential to containing the crisis, and so far it has operated effectively. But to make this technical financial network into the foundation for a new global order is a gamble. It worked on the well-established trans-Atlantic axis. But will it work as effectively if it is asked to contain the fallout from an East Asian financial crisis? Can it continue to operate below the political radar, and is it acceptable for it to do so? With the Fed in the lead it places the resources, expertise and authority of the world’s central banks behind a market-based system of banking that has shown its capacity for over-expansion and catastrophic collapse. For all the talk of “macroprudential” regulation, Basel III and Basel IV, rather than disarming, down-sizing and constraining the global banking system, we have—through the swap lines—embarked on, if you like, a regulatory race to the top, where the authorities intervene heavily to allow the big banks in some countries to continue what they were doing before the unsustainable ceased to be sustained. And without even the political legitimacy conferred by G20 approval. Not everyone in the G20 is part of the swap line system. The Fed’s safety net for global banking was born at the fag-end of the “great moderation,” the era when economies behaved nicely and predictably, and when a “permissive consensus” enabled globalisation. Though a child of crisis, it bore the technocratic, “evidence-based” hall marks of that earlier era. It bears them still. Can it survive in an age when the United States is being convulsed by a new wave of economic nationalism? 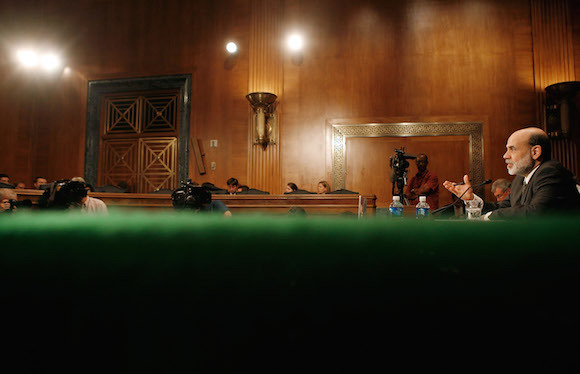 Is there still a guardian angel watching over the Fed on Capitol Hill? And with Trump in the White House, how loudly should we even ask the question?